It took 3.5 years of permit hassles, but Marin County supervisors Tuesday finally told Nan McEvoy she can erect a 149-foot-high wind turbine at her olive-oil-producing ranch along the Point Reyes-Petaluma Road. County planning commissioners had previously rejected the windmill proposal in a 6-to-1 vote. The supervisors, in contrast, unanimously approved it in a modified form. McEvoy has had to contend with a chorus of neighbors who didn’t like the proposed location (so she moved it) and the proposed height (so she repeatedly lowered it, from 246 feet to 210 to 189 to 149). Ironically, they simultaneously warned about windmills killing raptors. That has been a problem with small wind turbines. The blades spin so fast the birds don’t always see them. A longer blade, which requires a taller tower, spins much slower, making it easy for to birds to see it. Unfortunately, the neighbors didn’t want to see it themselves, and McEvoy agreed to monitor for three years the windmill’s effects on birds. As it happened, one of the times I interviewed McEvoy was back in 1996 just before the County of Marin issued a permit for the plant. 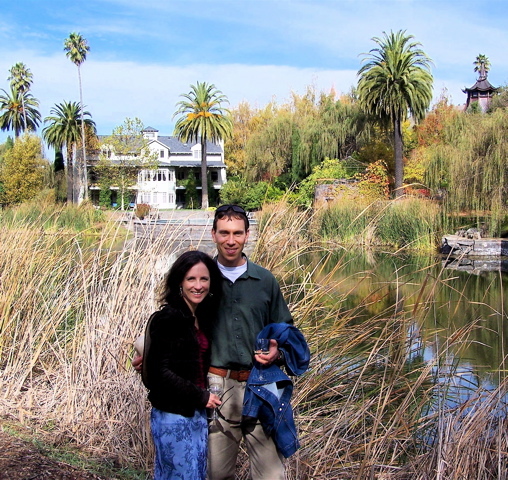 Former Point Reyes Light editor Jim Kravets and his wife Kristan at McEvoy’s Victorian house and its pond during a harvest party. The pagoda at right (with a palm tree behind it) is part of the ranch’s dining room. For her to create this estate in agricultural zoning, the County of Marin required McEvoy to come up with a viable farm operation. She ended up pioneering olive-oil production in the county, exactly the type of result for which the zoning was enacted. McEvoy, who formerly chaired the board of The San Francisco Chronicle Publishing Company, had bought the 552-acre ranch in 1990 with plans to make it into a country estate. “I had been to Italy for cooking classes, and I didn’t think there was much good olive oil around [here].” Having read a cookbook called The Feast of the Olive, McEvoy contacted the author, Maggie Klein, who turned out to live in Oakland. 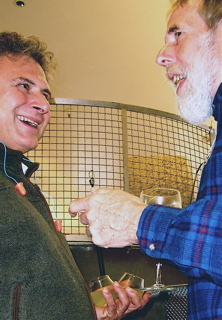 Klein said that much of the book’s technical information about olive-oil production came from an Italian named Maurizio Castelli, and she arranged for McEvoy (accompanied by an interpreter) to meet him. Before flying to Italy, however, McEvoy sent Castelli water and soil samples from her ranch, along with weather records, and “he decided, yes, we could do it,” she said. The UC Extension Service and others were initially skeptical, fearing the ranch would prove to be too cool, foggy, and windy, but McEvoy demonstrated that not only would olive trees grow well on her Red Hill property, they could produce award-winning olive oil. 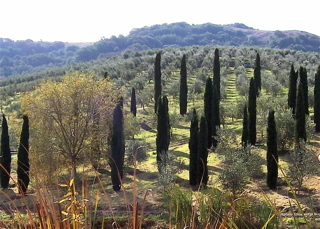 By now she has 18,000 olive trees growing on her hills. McEvoy’s success has encouraged other owners of West Marin agricultural land to plant olive trees, and they too use her press. For several years, I have attended harvest parties at the ranch, hosted by her and (in recent years) her son Nion, chairman and CEO of Chronicle books. The guests have typically been a mix of politicos, ranchers, and members of the press. To say McEvoy has always been “well connected” would be an understatement. Many years ago, it was not uncommon to see her on the arm of Adlai Stevenson. At a harvest party five or six years ago, I found myself seated next to Congresswoman Nancy Pelosi, who two weeks go became the first woman (not to mention the first Californian and the first Italian-American) Speaker of the House of Representatives. 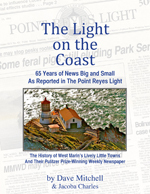 Our conversation alternated between her impressions of Congress, which were pretty dreary at the time, and her husband’s reminiscences of spending time as a youth on Steve and Sharon Doughty’s ranch in Point Reyes Station. Family members then owned the ranch. McEvoy not so long ago was a director of the American Farmland Trust, a nationwide nonprofit which tries to keep agricultural land in agriculture despite the financial pressures on ranchers and farmers. As most environmentalists here realize, reining in the conversion of agricultural land to residential and commercial development also preserves open space. The hassles McEvoy just endured to get permission to use alternative energy are symptomatic of the obstacles society puts in the way of all agriculture — even organic, sustainable agriculture. There is one significant error in your otherwise very good report on McEvoy. The approved windmill will produce only 250 kilowatts (not the 660 KW you reported). This means that the windmill they get to build will provide just 1/3 of the 750 KW that had been in McEvoy’s orginal plan, as submitted to the Planning Commission. 750 KW would have been sufficient to provide all of the ranch’s energy needs — electric and propane (propane being a big cost to the operation). The approved 250-KW windmill will replace only the PG&E electricity; the ranch will still have to buy huge quantities of propane (or invest in other, much more costly, alternative sources of energy). The sad part of this (and the reason I was the only Planning Commissioner to vote in favor of the original windmill) is that the windmill they asked for to begin was totally consistent with every objective criterion and condition of the zoning, the Development Code, the Countywide Plan, etc. Indeed, the County’s own rhetoric actually encourages projects such as the McEvoy windmill. Even the U.S. government is finally getting the message that global warming is real and is happening. Under such a reality, how can we here in Marin (of all places!) say that we’re in favor of alternative energy projects, but only if they don’t offend our “rural aesthetics”? Is this a luxury we as a nation, a people, a planet, can any longer afford? I’m happy that the Supervisors saw the issue much more realistically than the Planning Commission did, but it’s too bad that in the process the McEvoy project had to get scaled down to only one-third of what could have been done here. Sparsely Sage and Timely is powered by	WordPress 4.9.10 and delivered to you in 0.552 seconds using 55 queries.